Matter occupies three-dimensional space. Just how do children conceptualize this? Do they differentiate between amount of stuff, weight, and volume? How do they judge the size of objects? Comparing how much space two objects take up: What invariant do they attend to? In order to assess students’ understanding of volume before they have learned to define the term (much less use a formula such as V = L x W x H), we ask them to simply judge the relative size of physical objects. From their explanations we infer what are attending to. Then we ask them to measure the objects’ size, using a method and instruments of their choice. Figure 5: Stimuli used in the volume task. 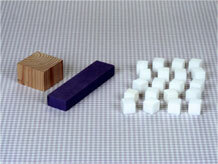 Children are shown a wood block and a purple foam block and asked: Which is bigger? That is which takes up more space? How can you use the white cubes to measure the amount of space each block takes (or fills) up? Approximately one half of the students at the beginning of Grade 3 judge a block’s size by its length or perimeter (see Figure 5). Roughly one third of the students pay attention to its area—either the size of a single face or the combined area of several faces. Only exceptionally do third grade students judge sizes on the basis of volume (for example, by building a replica of a block from cubes and then counting the number of cubes). Figure 6: Properties (invariants) that incoming Grade 3 students attended to in judging the size of objects. Perimeters, surface areas, "footprints", and lengths are of course spatial magnitudes. However, volume is a particular kind of spatial magnitude that needs to be compared to and differentiated from the others. 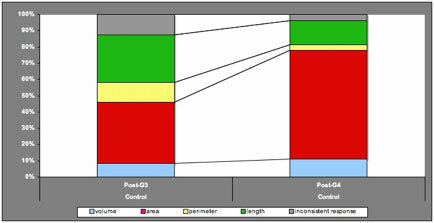 Over time, the Inquiry students make greater progress than control students in attending to volume (compare Figures 7 & 8). So there is clear evidence of impact of participation in the Inquiry Project lessons. 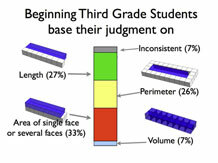 Even so, by the end of grade four, still less than half of the treatment students have a solid grasp of volume. How should this be interpreted? Inquiry students who still do not judge size by volume have nonetheless made important progress. As Figure 7 reveals, they have moved away from one-dimensional judgments of size (length and perimeter) towards area (and sometimes volume) by the end of fourth grade (especially those who are doing surface area). 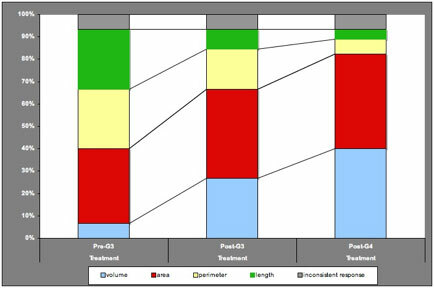 In addition, in another task, we found Treatment students, but not Control students, had made considerable progress in understanding that it is volume rather than weight that is relevant to water displacement. We are looking forward to seeing whether their progress continues in grade 5. Figure 7: Invariants attended to by Treatment students in judging size of 3-dimensional objects (a) before 3rd grade curriculum; (b) after 3rd grade curriculum; and (c) after 4th grade curriculum. Figure 8: Invariants attended to by Control students. At the end of Grade 4, the Control subjects have not shown any greater awareness of volume. They have, however, reduced their reliance on length and perimeter.